Venice is a wondrous place. The winding alleys and the always half heard sound of waves gives a sense of mystery. Though this also gives a sense of chaos and confusion. 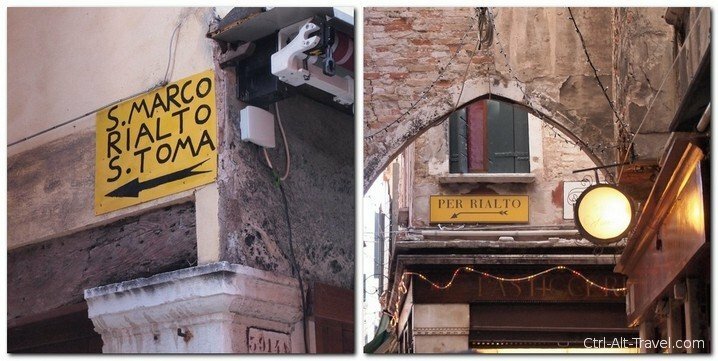 Thankfully there are plenty of signs in Venice. It is a tourist destination after all, so not just directional but also advertising. 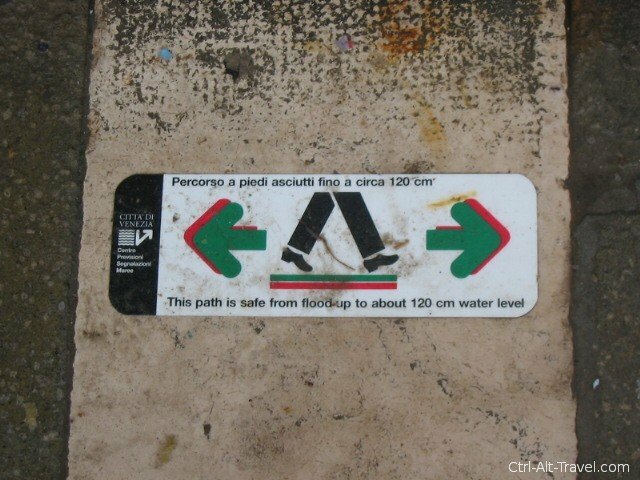 But even these signs fit to Venice in their own way. I like what signs say about a place. Sometimes signs say more than the postcards and the glossy magazines can. 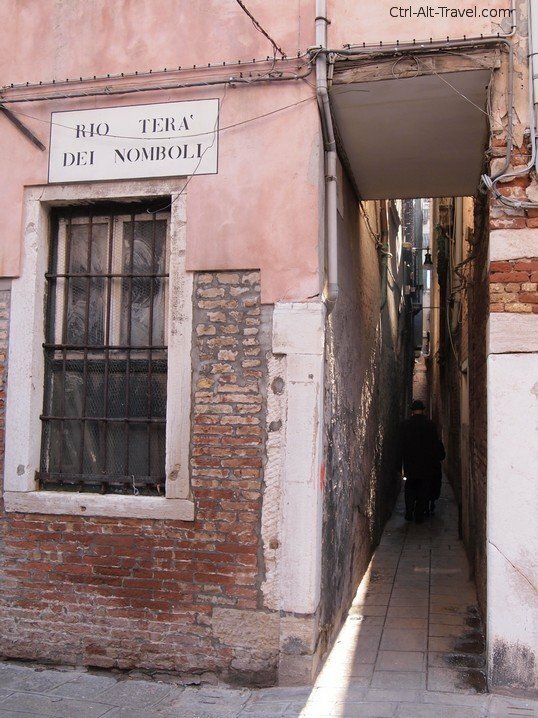 Venice is a mass of alleys. The relationship between how wide these alleys are and how important they are for traffic is non-existent. The most direct route from the train station to Saint Marks Square over the Rialto bridge winds down all kinds of tiny alleys even splitting in places. I don’t tend to get lost, but Venice gets to me every time. Thankfully there are a fair number of directional signs in the city. 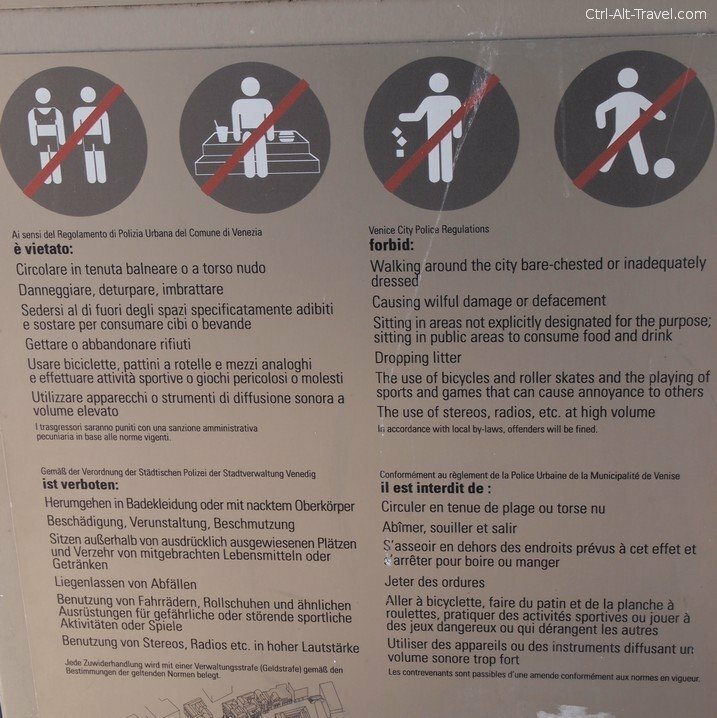 As long as you don’t stray too far from the main tourist ways there are signs points to the major sites or the train station. Even still, expect to make wrong turns. Take your time and explore, but bring patience and perhaps some breadcrumbs. Having a map doesn’t help so much. Streets merge with plazas and unnamed alleys lead to hidden courtyards. The major conduit through the city is the Grand Canal. Vaporetto are like water-buses that run in routes down this and around the outside of Venice. 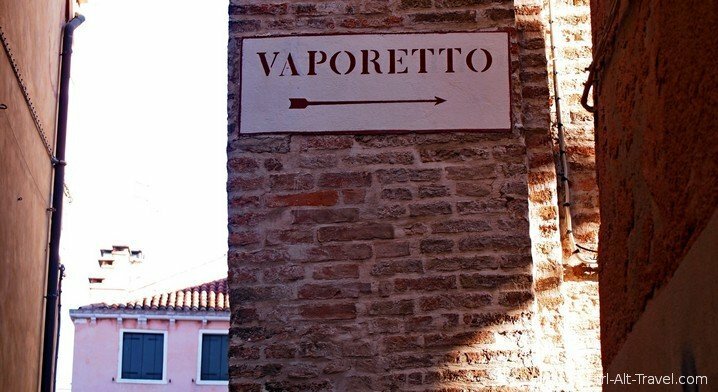 Knowing where the Vaporetto is can help you keep your bearings with finding home again. Chaos abounds. We were in Venice during Carnevale and the crowds were insane. People everywhere pushing and swinging their cameras about. Even without the festival I can imagine it being a crowded place. So there are signs for what is not allowed. See! There are just warning signs in Germany! Especially the no-eating in non-designated spaces. I have heard they are doing this is Rome too. Water is everywhere in Venice. Even sometimes in places you would rather it not be. 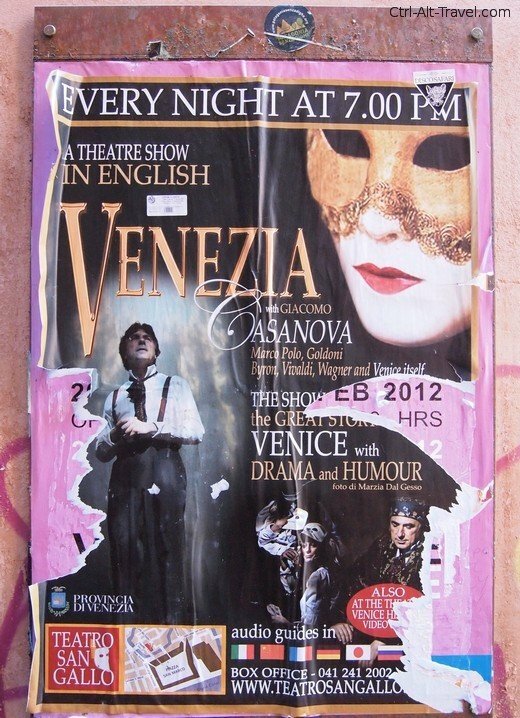 This picture is a number of years old, but shows a bit of the tenuous relationship between Venice and the sea. The sea that both cradles and threatens the city. 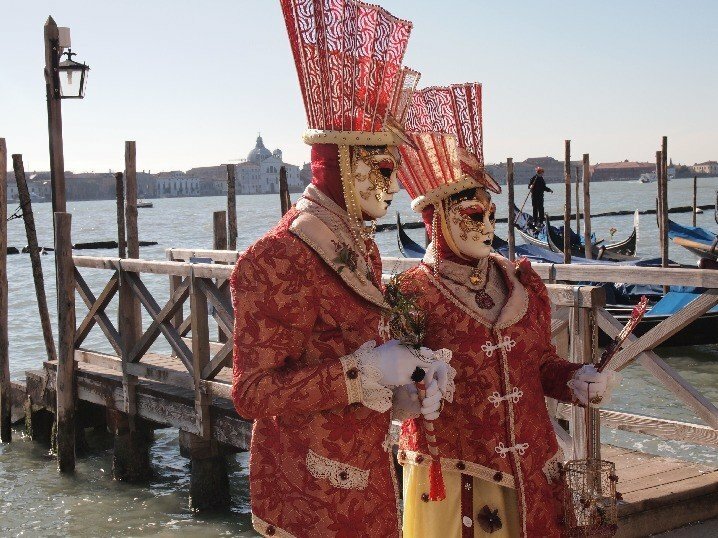 Venice is a tourist destination. People come to see and experience. I come to wander and watch people. I liked this sign. Not because of what it was advertising, I honestly have no clue if the theater piece is any good. I liked it because the ripped bits and the mask underneath just seemed to fit into the mystique of the city. The mix of grand and slight decay. I saw similar things in Milan. 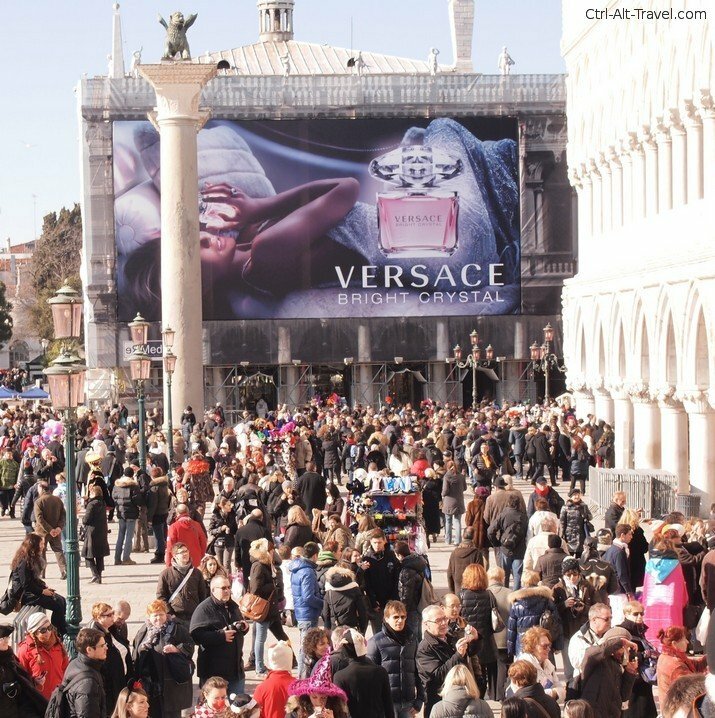 Enormous ads in the public squares advertising clothes or perfume. I get that the historic buildings and the city needs to support themselves, but it still seems a bit of an eyesore to cover a grand building (part of the reason to come to the place) with a modern marketing splat. Oh and by the way, look at all the people!! Seriously crowded and this was fairly early in the morning. As you are lost wandering in the maze that is central Venice take peeks down the various alleys and branches of the main way to check out the various restaurants and business signs. I liked the mix of the green awnings and the bakery/bar/restaurant sign. Venice is a great “postcard destination”. St. Marks and the Rialto are impressive. The city holds a lot of mystery even today. It is also a great place to get beyond the postcard views and duck down a side alley. 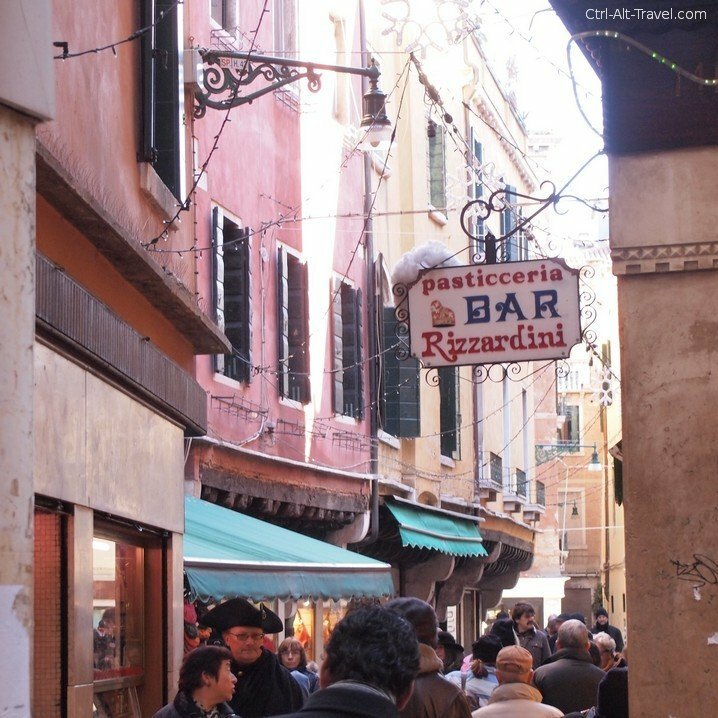 Check out the signs of Venice, get lost and find yourself, and see if it helps understand the place better.